El Terrible is the new champion. He defeated Diamante Azul on October 29, 2017 to win the championship. CMLL held a Torneo Cibernetico to crown a new champion on October 22, 2017 with Diamante Azul, El Terrible, El Cuatrero, Blue Panther Jr., Euforia, Gran Guerrero, Kraneo, Pierroth (CMLL), Rush, Shocker, Stuka Jr. and Vangellys with the final 2 left in the match meeting on October 29, 2017. In 2007, this title was part of AAA's World (Mega) Unification Tournament to crown a inaugural AAA World Heavyweight Champion. Charly Manson carried this championship into the match, but did not actually get to defend it, as he only faced foreigners in his two tournament matches. Manson lost in the semifinals. El Mesias, the winner of the match, did not take the belt (being from Puerto Rico, he was not eligible). 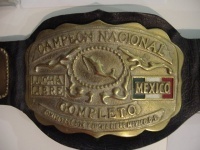 With the emphasis on a single heavyweight championship, AAA stopped mentioned this belt on it's television show, and no more defenses are known to have happen. On rare occasions, Charly Manson would wear it (most notable TripleMania 2009), and an article in AAA's official magazine Dos de Tres listed Manson as the reigning champion, but the championship itself was effectively defunct. Manson retained physical possession of the belt. Charly had a falling out with AAA in 2009, leaving the company to join the Perros del Mal in fall. Starting in late November, Charly began proclaiming himself as the current heavyweight champion again and defending it on independent shows. Charly defended it a couple shows on in late 2009 and 2010 before dropping as part of a feud with X-Fly. Despite being the only title defended in Perros del Mal at this point, it's been treated like a semimain feud, and X-Fly winning the title is a big step up for him. Hector Garza picked up the championship in 2012 on a Perros del Mal show, and it appeared the championship would still be defended on those shows. However, the promotion stopped running regular shows. Garza announced a temporary retirement from the ring in October 2012 due to lung cancer, then passed away in May of 2013. CMLL held a Torneo Cibernetico to crown a new champion on October 22, 2017 with Diamante Azul, El Terrible, El Cuatrero, Blue Panther Jr., Euforia, Gran Guerrero, Kraneo, Pierroth (CMLL), Rush, Shocker, Stuka Jr. and Vangellys with the final 2 left in the match meeting on October 29, 2017. 1 Francisco Aguayo ? 1925 ? 2 Martinez Larrera ? 1930.11.?? ? 5 Francisco Aguayo  Yaqui Joe 1938 ? 11 Daniel Aldana Firpo Segura 1948 ? 4 Firpo Segura 1952.05.18 ? 12 Firpo Segura  Daniel Aldana 1952 ? 1 Red Terror ? ? Garza passes away on May 26, 2013. CMLL held a Torneo Cibernetico to crown a new champion on October 22, 2017 with final 2 in match meeting the following week for the championship. ↑ SuperLuchas - ended in the second fall due to injury to Halcon; ruled no contest.